When statistics are mentioned, people often call to mind a dull set of numbers that can only be interpreted by statisticians and mean nothing to ordinary people. But this is not true, especially if we take figures over a period of several years when comparing statistics. Let alone a period of 20 years. Comparison like that often reveals a true picture and clear trends, and sometimes even led to people wanting to change or improve our situation. Some numbers remain constant, while others change. In geographic terms, we cannot expect the number of square kilometres that Slovenia covers to increase, so this is one of the numbers that has not changed in the past 20 years. 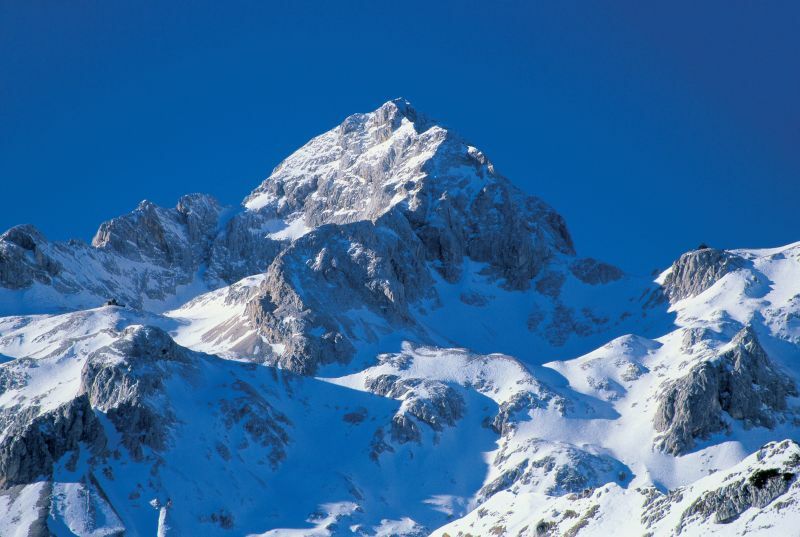 After all these years, Slovenia still covers an area of exactly 20,273 km2 and has 46.6 kilometres of coast, 1370 kilometres of state borders, and, of course, Triglav, remains its highest mountain at 2,864 metres. As a country famed for its green landscapes, Slovenia may be pleased with the fact that its forest cover has slightly increased (from 56.5% in 1993 to 58.5% in 2009). The first statistical change to be mentioned looking at the past 20 years is the change in population size. While in 1991 some Slovenes were worried about the fact that their number was less than two million (the actual number was 1,998,912), the population of Slovenia today is 2,046,976. In the past 20 years, the number of newborn babies per year has also slightly increased (from 21,583 babies in 1991 to 21,856 babies in 2009). In Slovenia, as elsewhere in Europe, women tend to have their first child later in life. Names given to babies at birth are now quite different than before. In 1991 the most popular names for boys were Matej, Marko, Gregor, Rok and Andrej, and for girls Maja, Nina, Mateja, Petra and Anja. Today, the most popular names for boys are Luka, Nik, Žan, Jakob and Nejc, and for girls Lana, Eva, Sara, Nika and Zala. We can also be pleased with statistical data regarding schools, education and culture. Although there are now fewer libraries in Slovenia than there were 20 years ago (1,521 libraries in 1989 and 903 libraries in 2007), people are still very happy to borrow books from libraries (7,366 books borrowed in 1989; 25,644 books borrowed in 2007). Slovenes are also all the more encouraged to write and create. 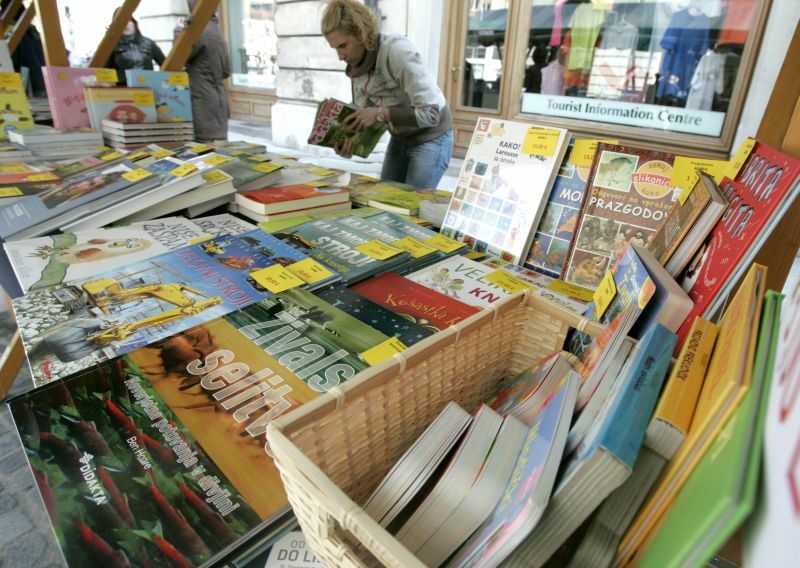 As many as 1,400 books and brochures written by Slovene authors were issued in 1989, while this number had increased to 6,358 in 2009. 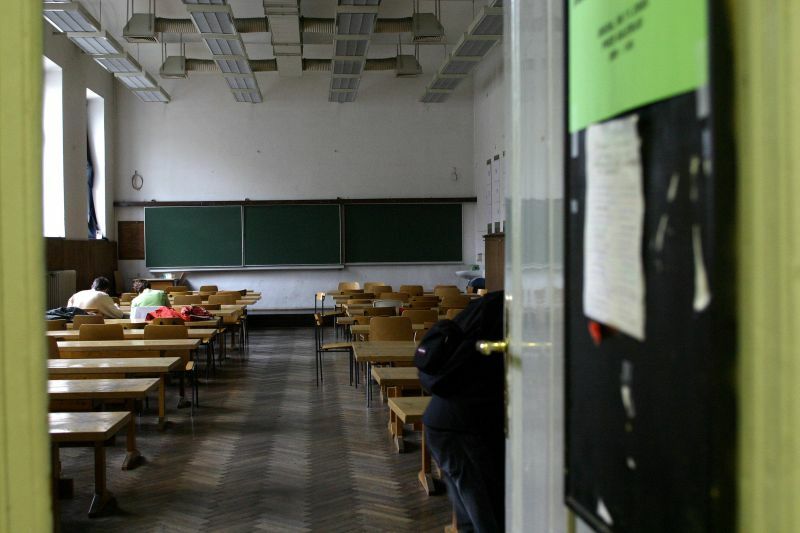 We often hear that Slovenia is a country of young people, and this is also borne out by statistics on the number of students in higher education institutions and universities (this number was 34,228 in 1989, increasing to 114,873 in 2009). Over the past 20 years, the number of graduate and postgraduate university students has increased as well (in 1991 this number was 6043; in 2009 it increased to 18,103). Today, as many as 22.6% of adults, aged from 25 to 64 years, have completed higher or university education (in 1991, this percentage was 11.7%). Life expectancy has also risen significantly in the past 20 years. In 1991 life expectancy was 69.5 years for men and 77.4 years for women; in 2009 it stood at 75.8 years for men and 82.3 years for women. For much of the past 20 years, until the economic and financial crisis hit, economic indicators suggested favourable economic conditions. 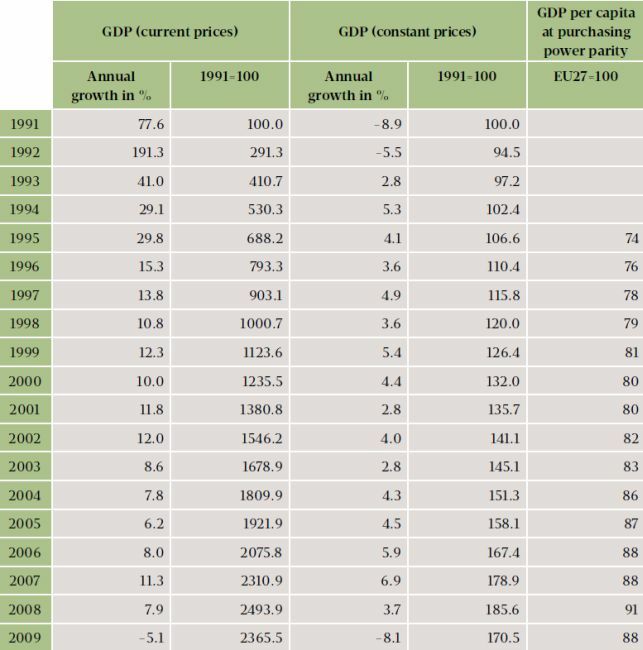 GDP and purchasing power were rising consistently until 2009, and further growth is expected in the coming year or two. In 1989 GDP per capita stood around EUR 5,417, but by 2009, it had risen to EUR 17,000. 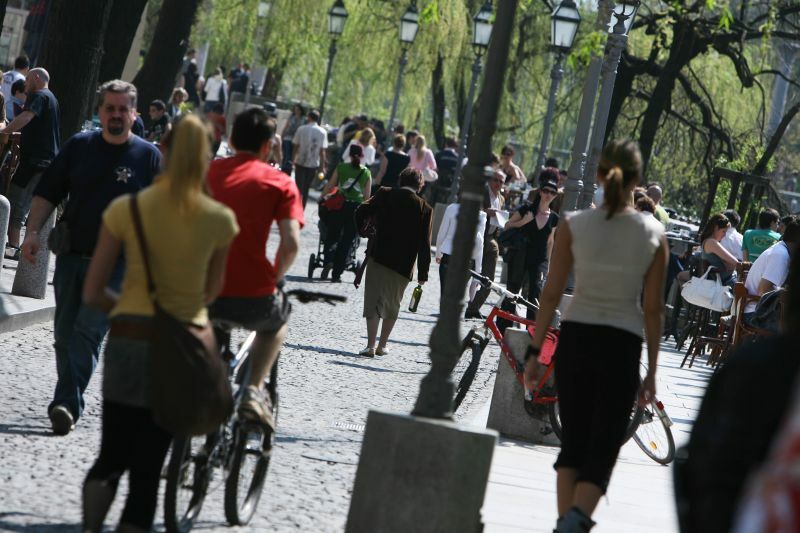 Although the number of people registered unemployed in Slovenia has increased recently (today this number stands at 114,000 compared to 75,079 in 1991), with an unemployment rate at 7.2% (ILO method), Slovenia still ranks among the EU countries with the lowest unemployment rate. Statistics on areas such as infrastructure development and mobility also reveal much about the path the country has travelled. 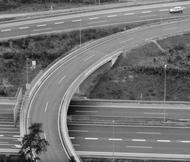 In the past 20 years, Slovenia has made considerable ‘progress’ in terms of the number of cars. There were 554,592 cars on the roads in 1989, with this number increasing to 1,058,858 by 2009. 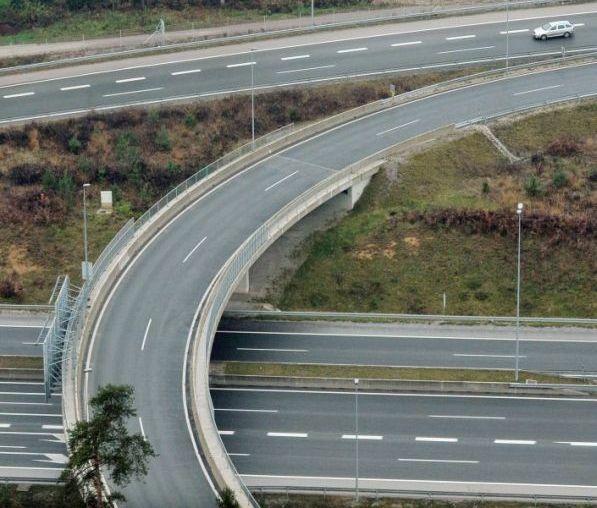 Slovenia has also built more motorways (the length of motorways was 229 km in 1989 and 1,228 km in 2009), but has been somewhat lagging behind in building the railway infrastructure (the total length of national railway lines was 1,196 km in 1989 and 1,228 km in 2009). Slovenes also make more telephone calls than they did 20 years ago. There were 630,039 phones in use in 1989, and 925,258 in 2009 (in 2008, this number stood at 879,257). Looking at all these figures, it is clear that statistics is anything but boring. To prove this statement right, more interesting examples are given in the comparison chart below.